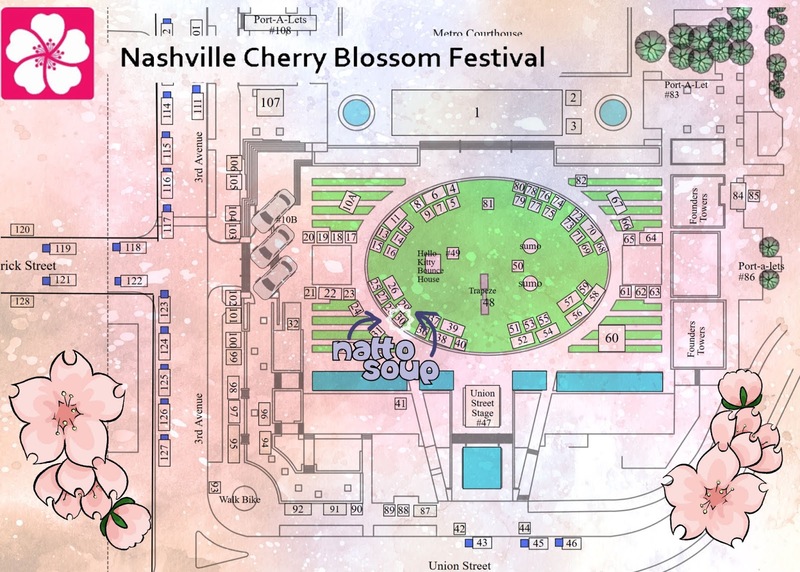 Nashville Artnerds, mark your calendars! I'm so excited to announce that I'm teaching classes through PlaZa! 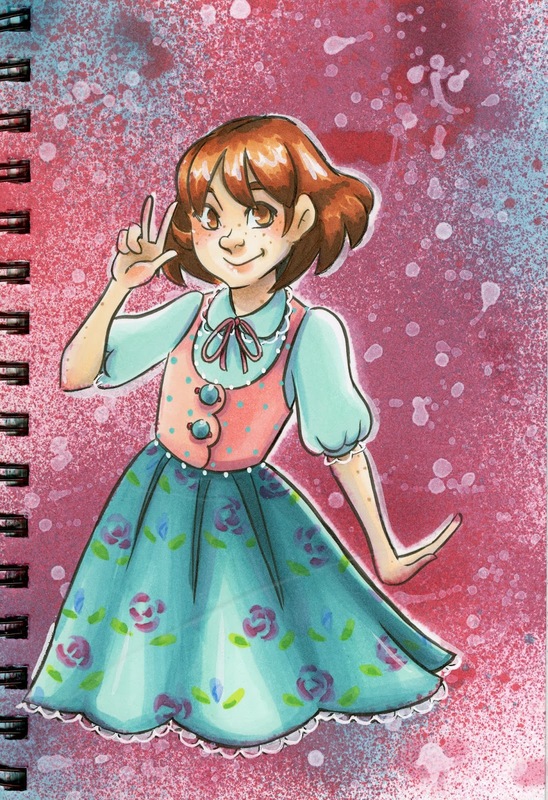 Even better—I'm going to be teaching marker classes, a longtime dream of mine! The icing on the cake? PlaZa is providing materials for class use, so you don't have to have your own markers to take these classes! 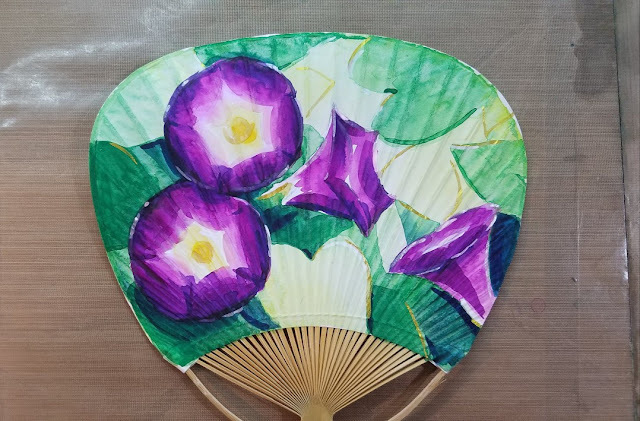 Each class is three hours in the afternoon, and most classes are on Saturdays and Sundays—perfect for people who work outside the home, or for teenagers interested in learning the ins and outs of markers. For those of you not familiar with PlaZa, it's a chain of art supply stores in the US East. 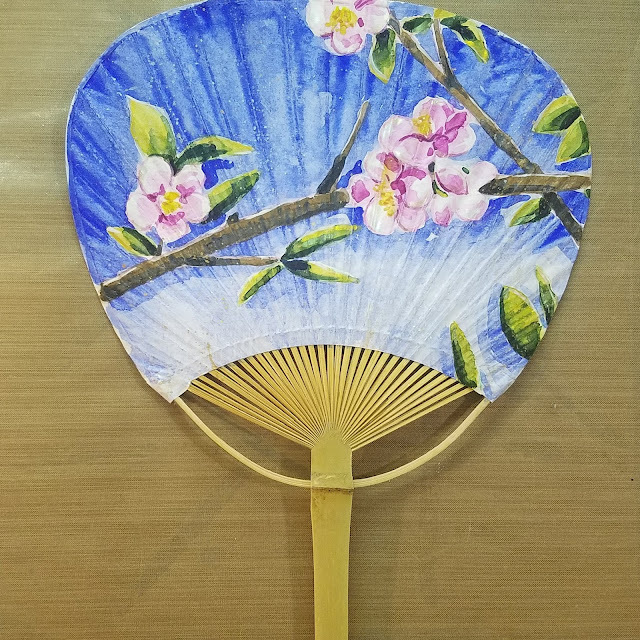 PlaZa hosts one of my favorite art supply events—Hands on Creativity—and has a wide selection of art supplies and classes available to area artists. 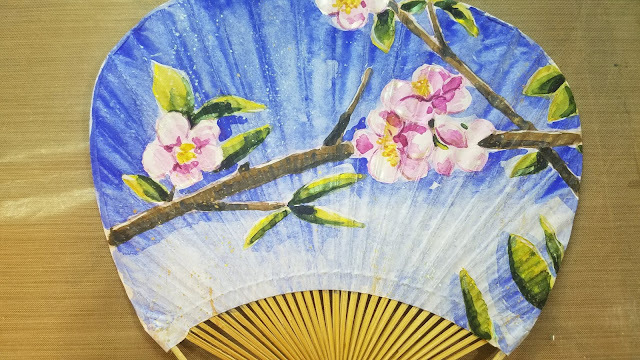 My goal with PlaZa is to offer classes that will appeal to younger artists, or artists who are young at heart, featuring techniques and materials inspired from my own artistic journey. Each class is standalone, but students who take the Copic classes will find that we're going to build on techniques. 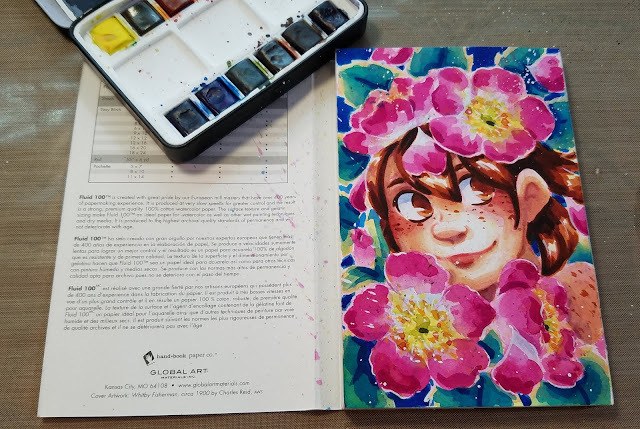 PlaZa has sponsored my Watercolor Workshop this Saturday at MTAC, and they've kindly provided paper and paint samples for attendees of this workshop! 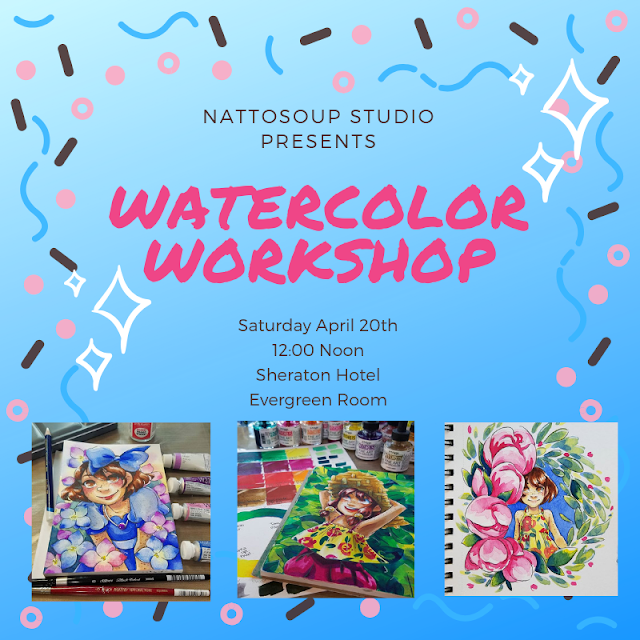 This workshop is free to MTAC attendees and is scheduled to begin at 12PM (noon) on Saturday, April 20th, 2019. You can check out a full calendar of my classes AND con appearances here! 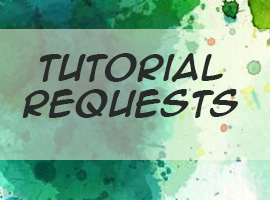 And if you'd like to be notified about classes- from class announcements to registration, sign up here. 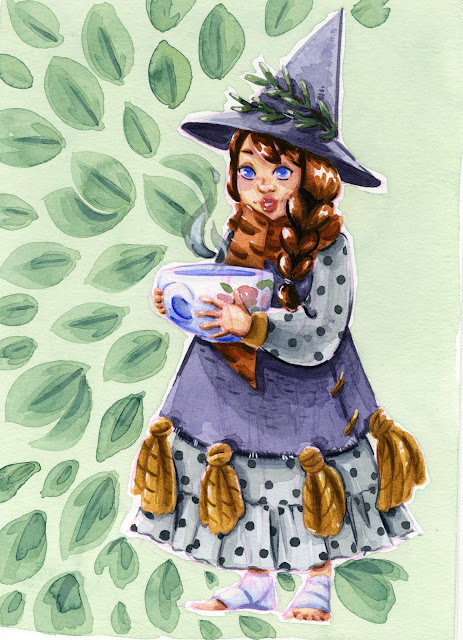 Learn the basics of painting in watercolor! 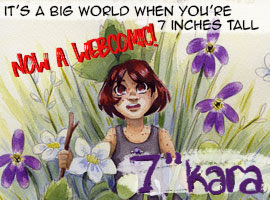 This class is focused on watercolor for illustration and comics, and is taught by a Nashville comic artist (me!). Learn about materials, techniques, and tricks in a hands on environment. 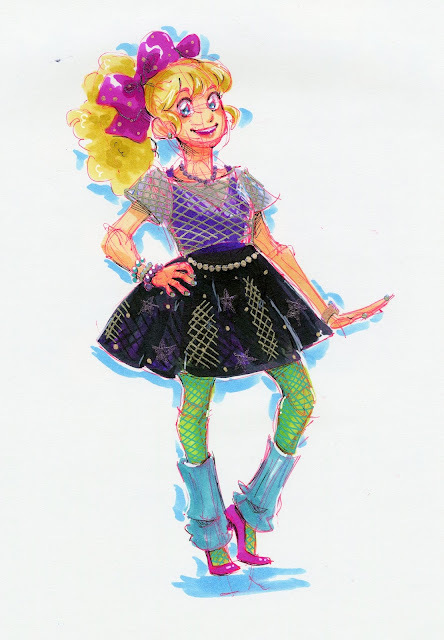 Leave the panel with fun watercolor samples, provided by PlaZa. A crash course in Copic markers! 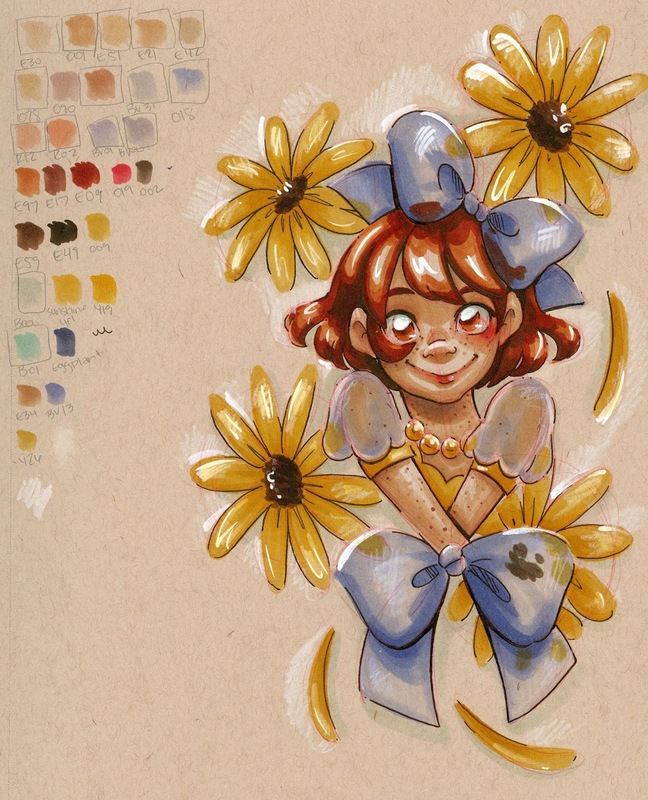 Learn the basics of Copic markers during this short course! 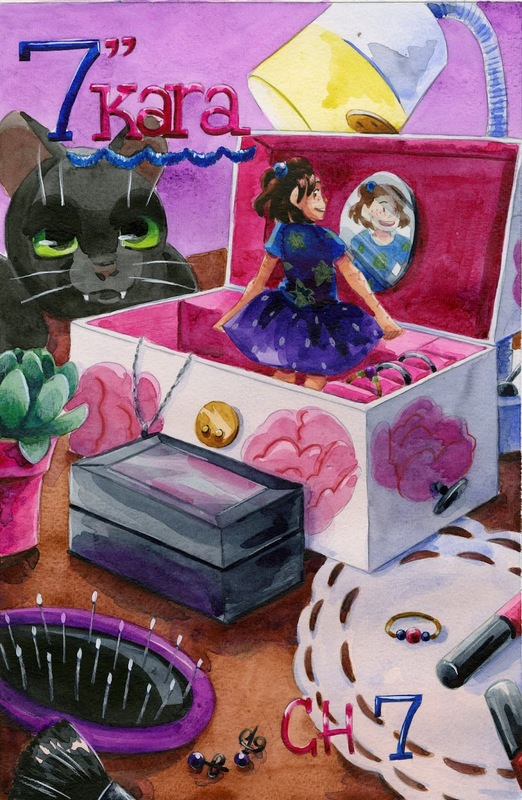 We'll cover marker acquisition, storage, and care, Copic compatible papers and inks, as well as selecting color palettes, blending, and creating depth. This class is perfect for stampers, scrappers, and illustrators! You don't need to be an artist, as line-art will be provided for your use, but you're welcome to doodle along. 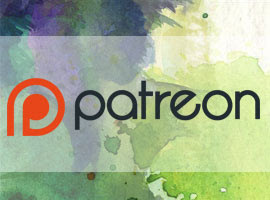 We're going to talk about selecting colors for skin, hair, and eyes, and cover techniques for makeup, blush, and shadows! 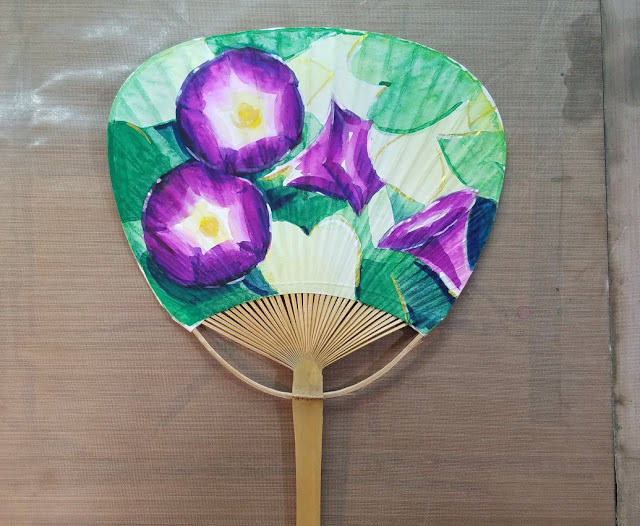 Learn how to use alcohol markers for beautiful botanicals! 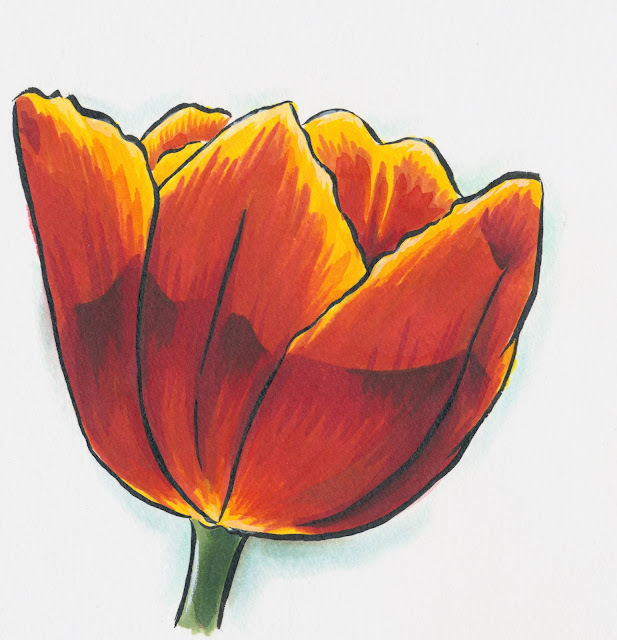 Alcohol markers pack a color punch—the vivid, brilliant colors are perfect for rendering flowers and foliage. 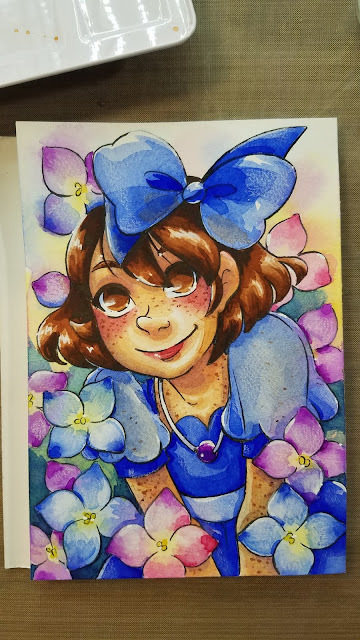 In this afternoon class, we're going to talk about techniques for creating depth of color, rendering dewdrops, and illustrating lush florals. Take your marker art to the next level! Toned paper provides a perfect backdrop for marker art and illustration! Choose between tan, grey, or blue as your base, and let your imagination run wild. 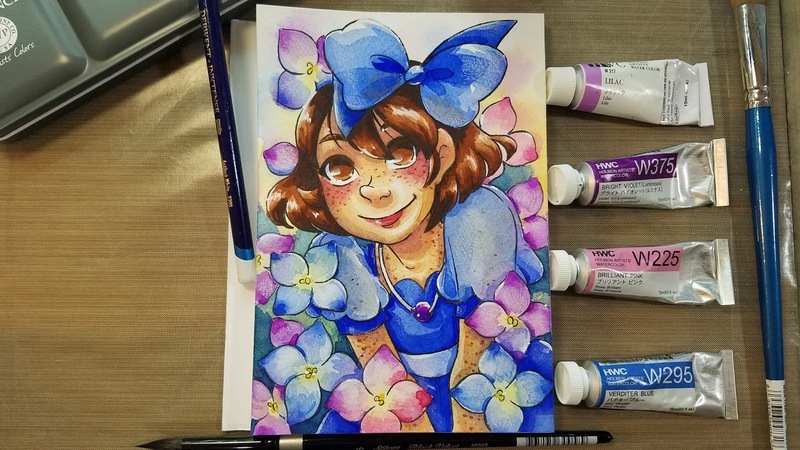 We'll talk about techniques for making your marker illustrations pop! 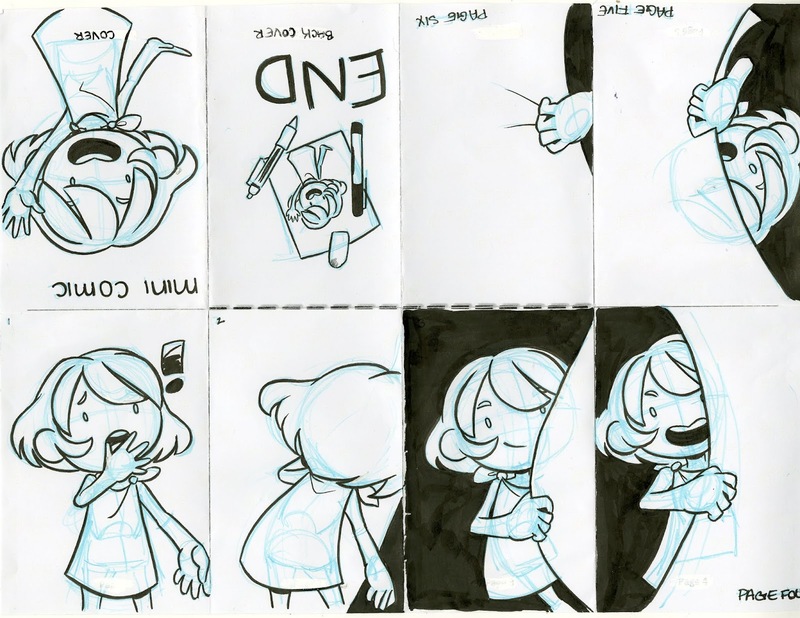 In this class, you're going to learn a magic trick—how to turn one sheet of paper into an eight page mini comic! 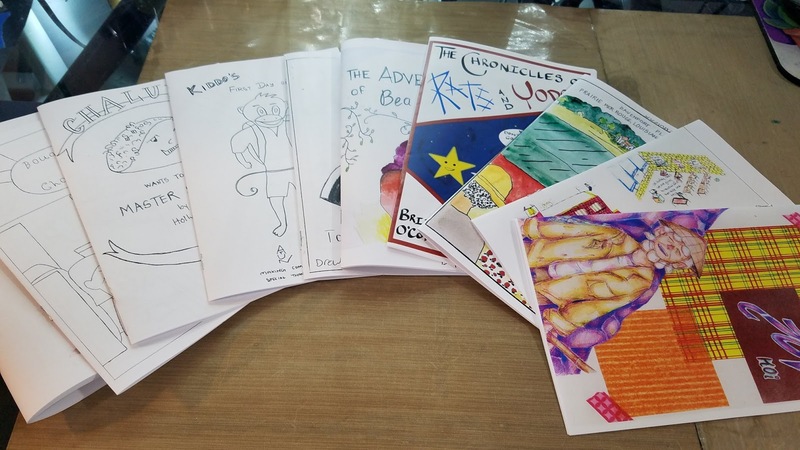 Learn the basics of storytelling and planning for a short comic, leave with your own comic to trade and exchange! Basic drawing skills useful, but not mandatory. Hey Nashville friends! I'm going to be at the Nashville Cherry Blossom Festival this Saturday, April 13th! 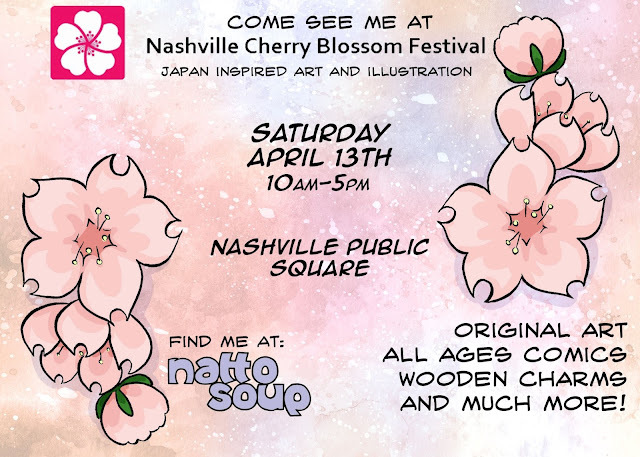 I'm going to be in booth 30 in J-Funland, so keep an eye out for a blue topped tent with lots of cherry blossoms! 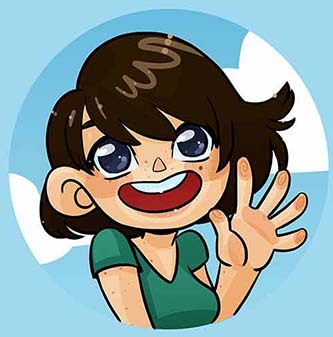 I will not be tabling at MTAC this year (but I will be around, don't worry!) 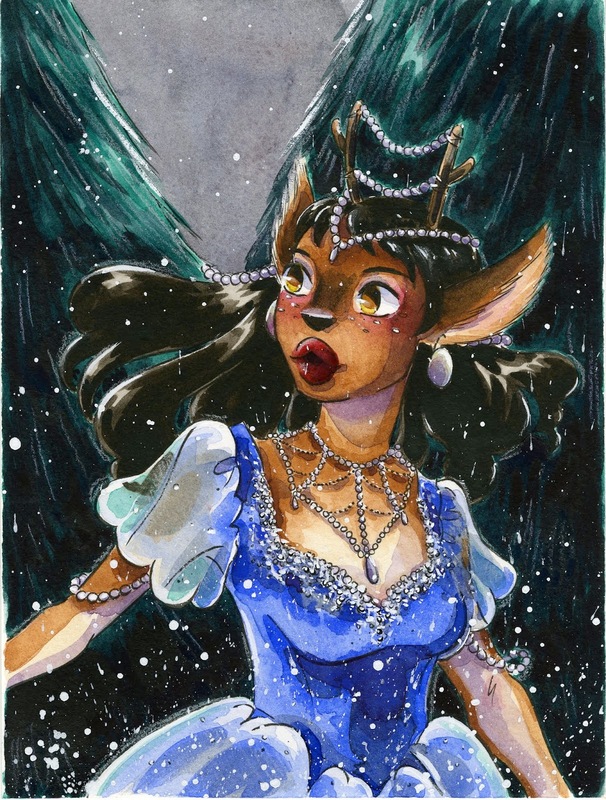 so if you want to commission some original art from me this year, please come see me at Cherry! I'm going to be taking mail in commissions, selling comics and mini comics (including a debut of Lilliputian Living Volume 2), having a flash sale on my Sassy Buttons, ribbons, and other cute things, and selling original art! 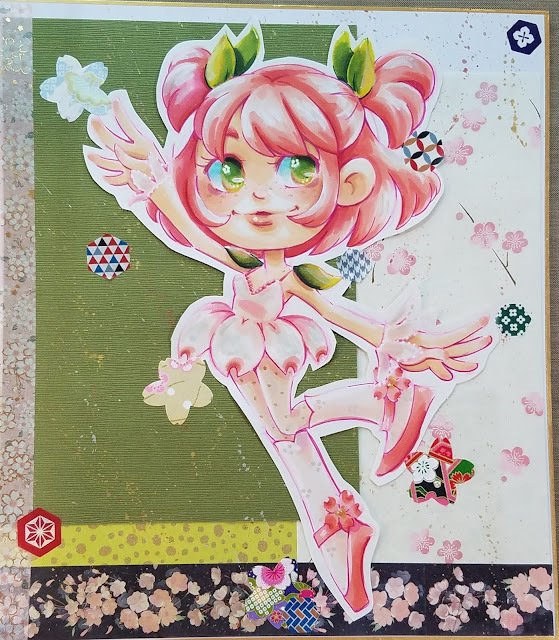 I'm going to have the cutie from the above con announcement video available for sale as well! 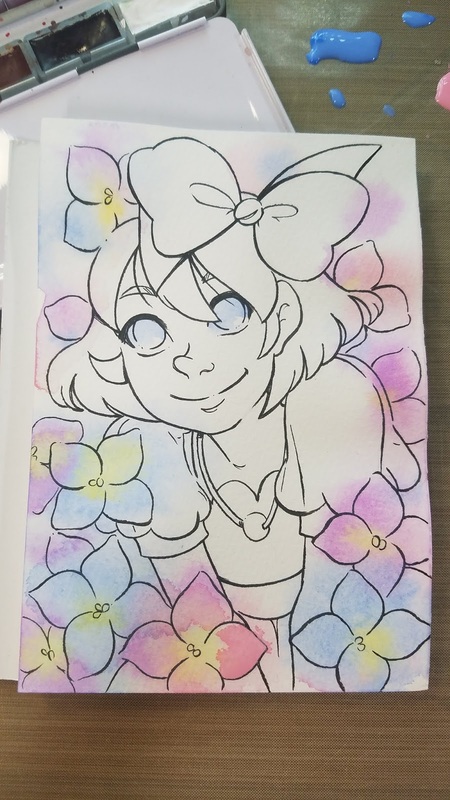 She's alcohol marker on chiyogami paper, so if you're the lucky one who takes her home, please do not display in direct sunlight, as she'll fade (alcohol inks are dyebased, and not archival). 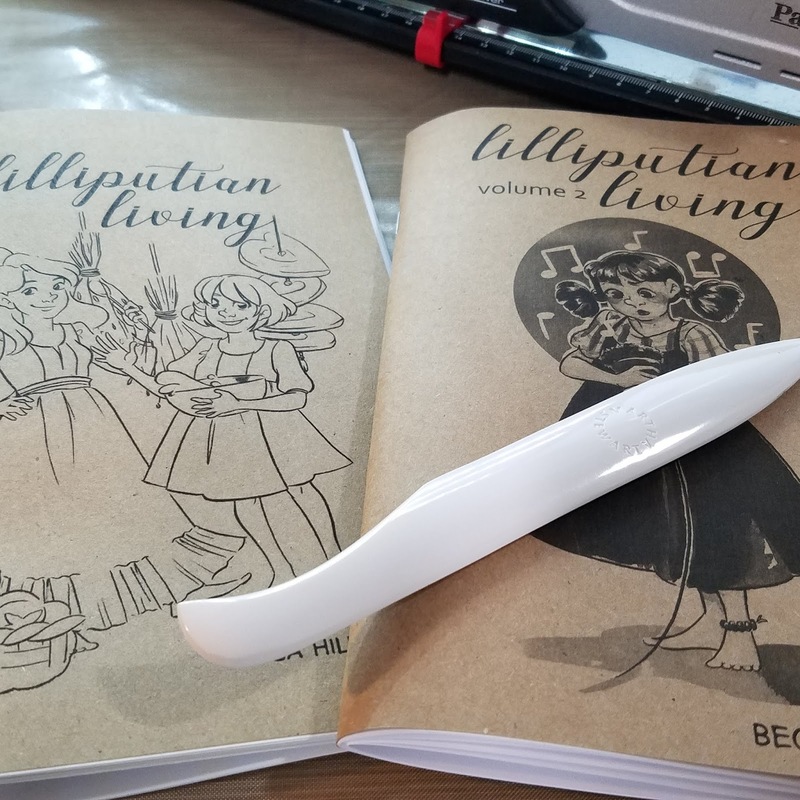 I'm debuting Lilliputian Living Volume 2 at Cherry Blossom Festival, and have brand new, hand assembled copies ready! I'm also hoping for warm weather because I have beautiful handpainted fans for sale. 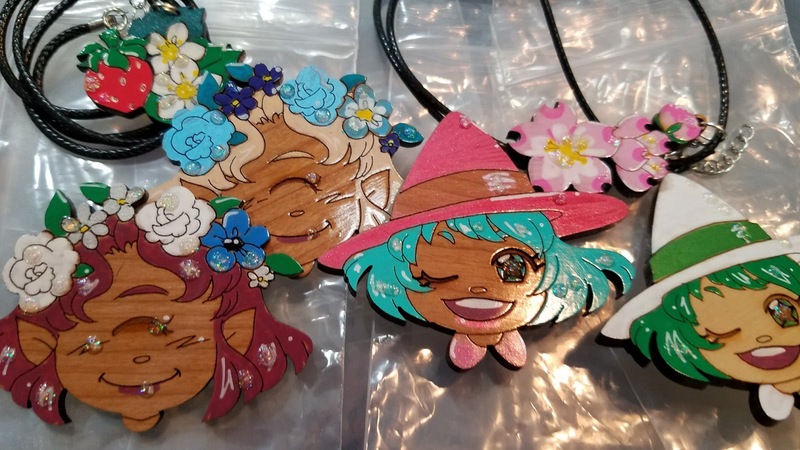 I have a batch of freshly painted and sealed wooden charms, as well as a selection of unpainted wooden charms, and I'm currently restocking my stickers and hope to have some new designs at the show. I'm also going to do a sale bin of sassy buttons, kawaii jewelry, and ribbons- so if you've missed those items, Cherry Blossom is a great chance to stock up! I hope I'll see you guys on Saturday! 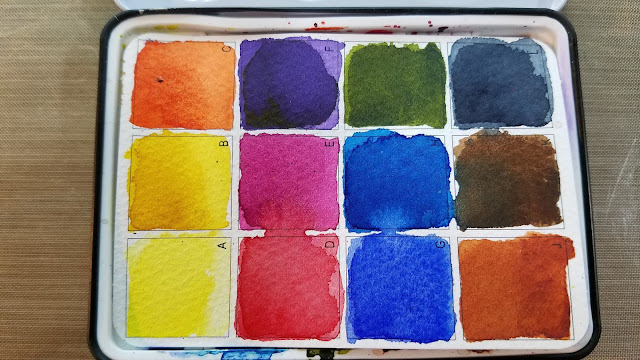 Generally, I avoided fluorescents and semi opaque multi pigment colors, assuming that since they have a tendency to fade, lift, and mix muddy, they had no real place in my palette. But after purchasing a few tubes of Kusakabe watercolors openstock while in Japan, I fell in love with the idea of using such colors sparingly, giving them the opportunity to shine. 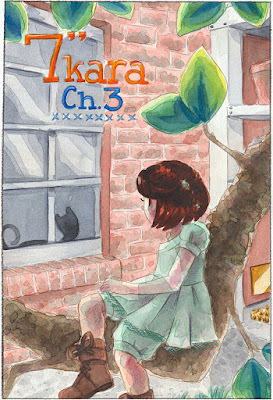 If you're in the US, you may have difficulty finding Kusakabe. Holbein, another Japanese watercolor brand, is easier to find and a bit better known. 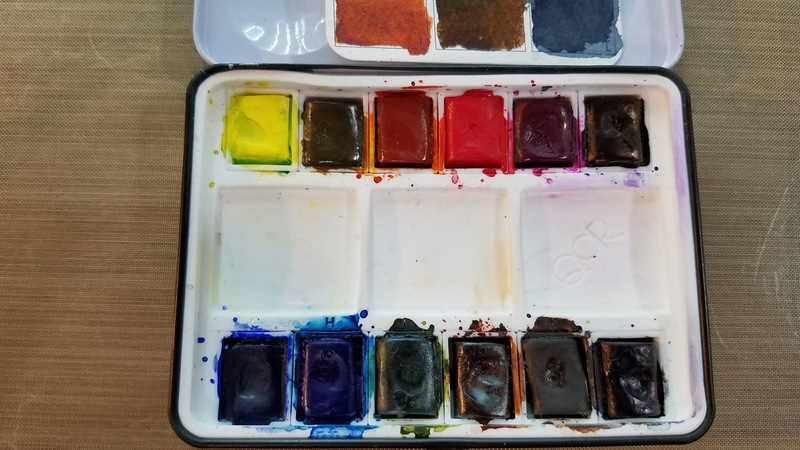 You may be familiar with the now discontinued Irodori line, a selection of traditional colors based on the sumi palette. Awhile back, I reviewed the Holbein HWC 12 color set available from Amazon. These tiny tubes deliver a lot of color, but also a fair bit of opacity. 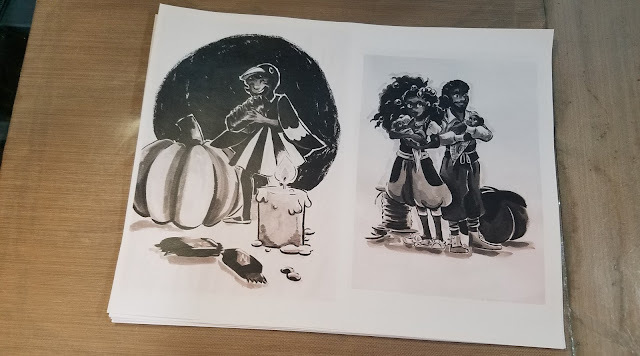 During the fieldtest, I decided this particular selection of HWC might be an excellent beginner option, or an option for a comic artist who wants to work in watercolor, but doesn't want to do a lot of mixing. Recently, I've started collecting more of Holbein's semi-opaque multi pigments and fluorescents. There's something really fun about getting a lot of color without doing much mixing. 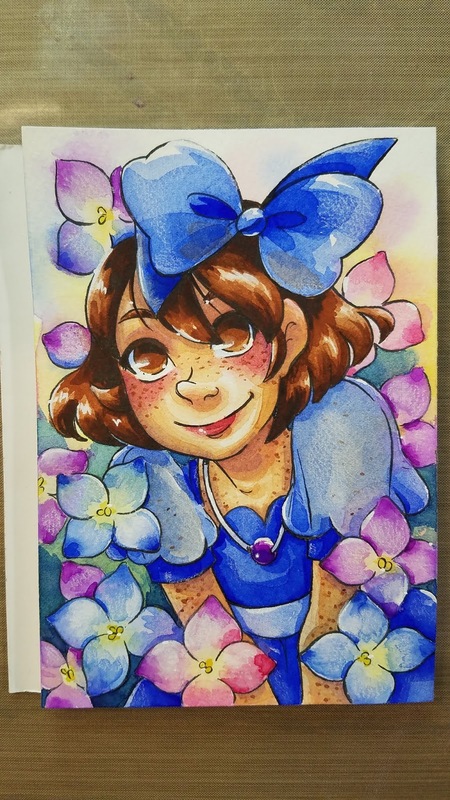 A recent acquisition of beautiful blues, pinks, and purples inspired the below hydrangea illustration. 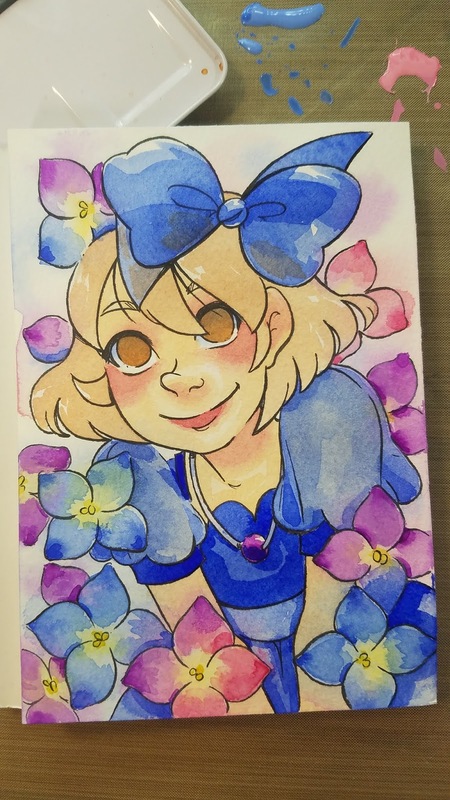 Holbein can't take all the credit though- I used my lovely Da Vinci mixing set for everything BUT the hydrangea. Color was applied into a clear wash to allow for diffusion. Color is intensified by another layer of application. Some wet into wet mixing is encouraged between colors, as some hydrangea blossoms are multi-colored. I find with these watercolors, it's best to keep your layers to a minimal- don't overwork the piece with too many glazes or details. 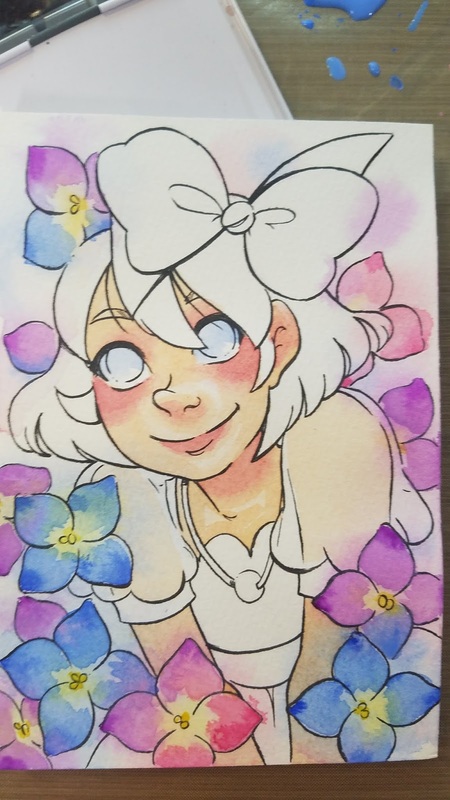 I have a timelapse video for this piece coming up, so if you'd like to see how I painted this, step by step, subscribe to my Youtube channel and hit that bell notification! If your major complaint about watercolor is it isn't saturated enough or doesn't pack enough color, Qor's got a palette that will single-handedly prove you wrong. 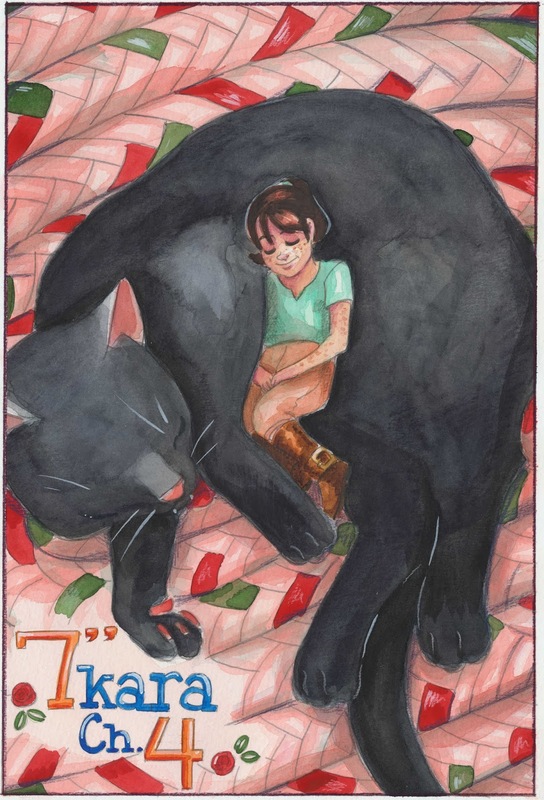 Qor is well known for their vibrant, vivid watercolors- particularly their blues. 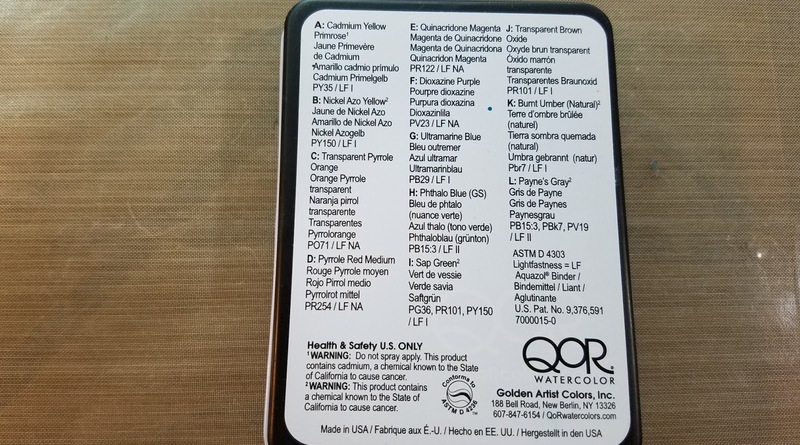 This is due to the use of Aquazol over Gum Arabic as a binder, as Aquazol is clear rather than yellow. Last year, Qor introduced a half pan travel palette, and this vivid little palette has quickly become one of my favorites. All of which are super saturated, and deliver quite a punch. 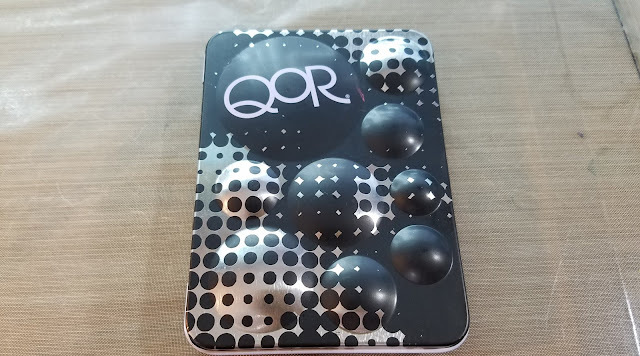 If you're used to traditional watercolor palettes, this palette will take some adjustment but if you enjoy painting florals, or want generous pigment and quick activation from your pocket watercolors, the Qor Mini Palette is a great addition to your studio. I reviewed these watercolors on my channel awhile back, and I highly recommend you watch both videos! 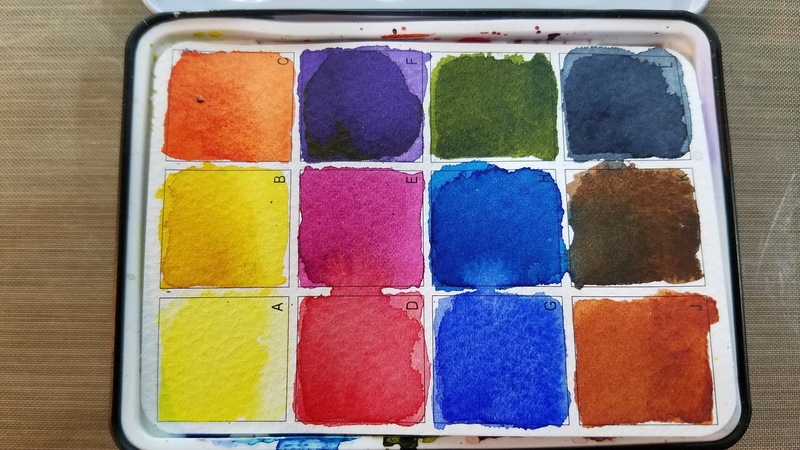 The unbox and swatch is a deep dive into the watercolors and the brand, the field test is a step by step tutorial that explains how to use these paints. 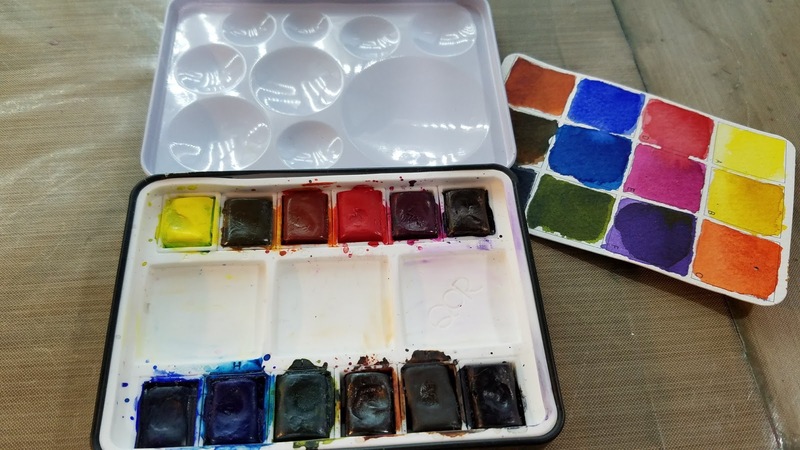 The Qor Mini Palette is limited to the 12 half pans that come within, but you can make your own using empty half pans and your favorite Qor watercolors. 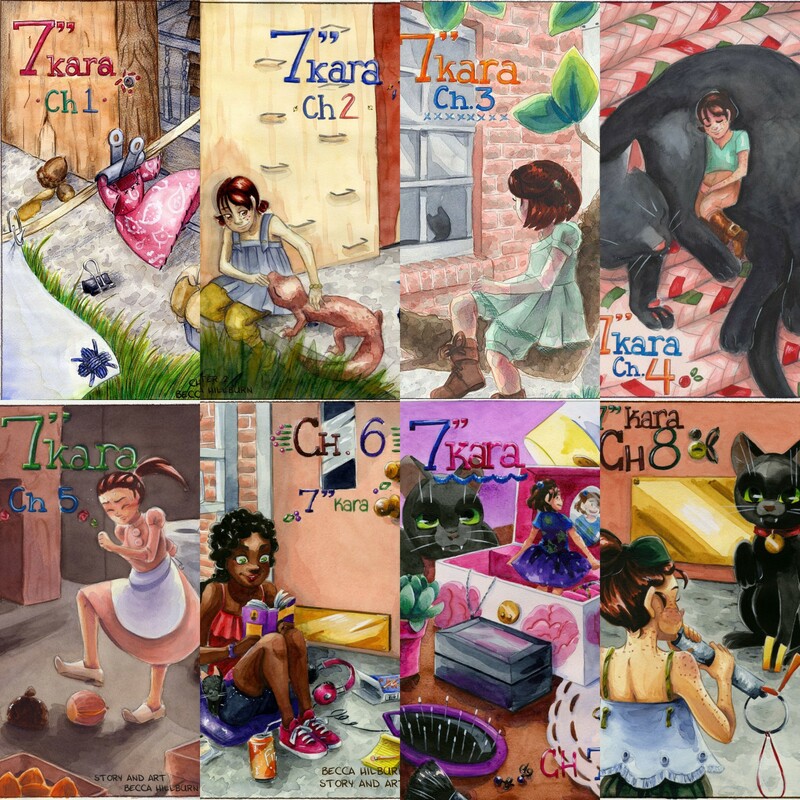 I thought it would be neat to layout all my 7" Kara covers and compare the progression. I used the Layout app in Instagram, which forces a square format, but I think this gives a neat idea of trends and changes over time. 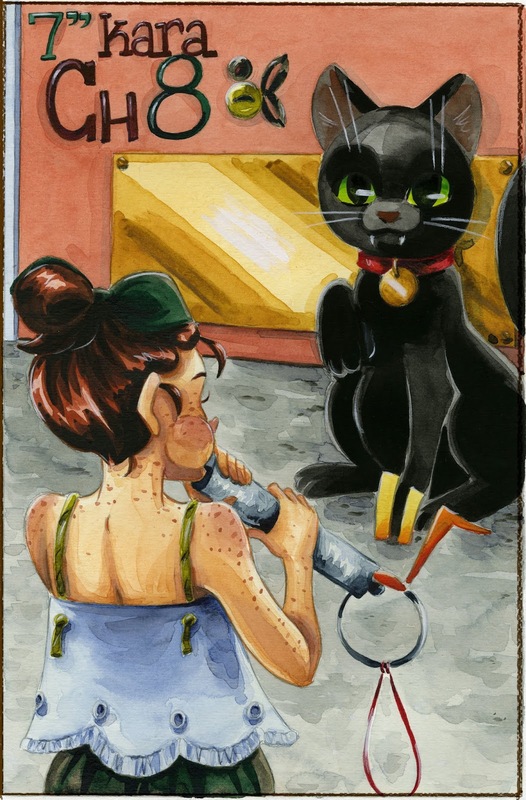 As time progressed, I tried to move away from my reliance on color pencils and watercolor pencils to add fine details, I refined my color sense and application, and worked toward pages that felt more finished. 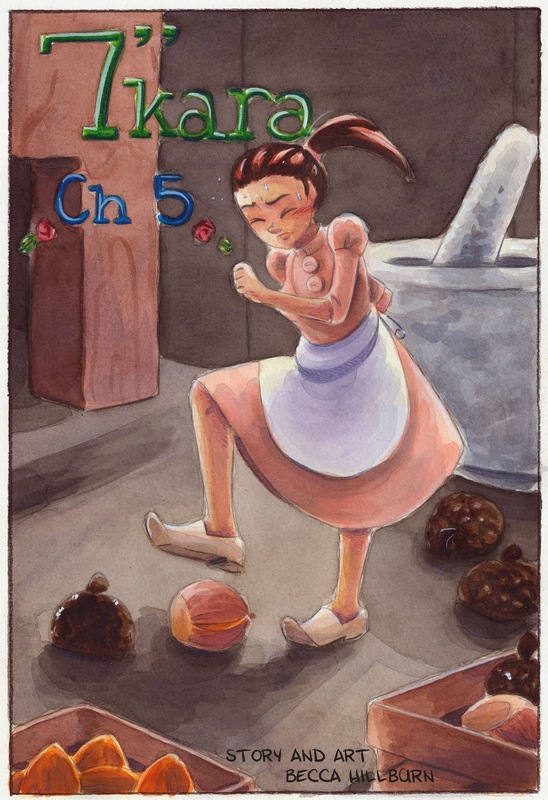 I tried to push my contrast and lighting as the chapters progressed and my watercolor skills improved. While covers alone don't tell the whole tale (obviously, you should read the comic), I think they paint an interesting picture of my progress over time. 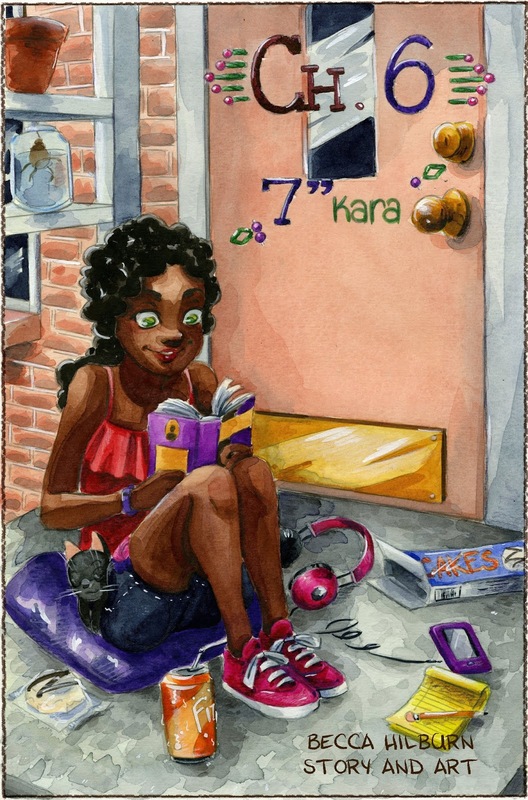 While Pancake and Kara feature prominently, Naomi is definitely due for another cover, and we've yet to see a cover where all three characters are featured. Neither Rowan nor Tanner have been on a cover yet- perhaps this is also in the cards? 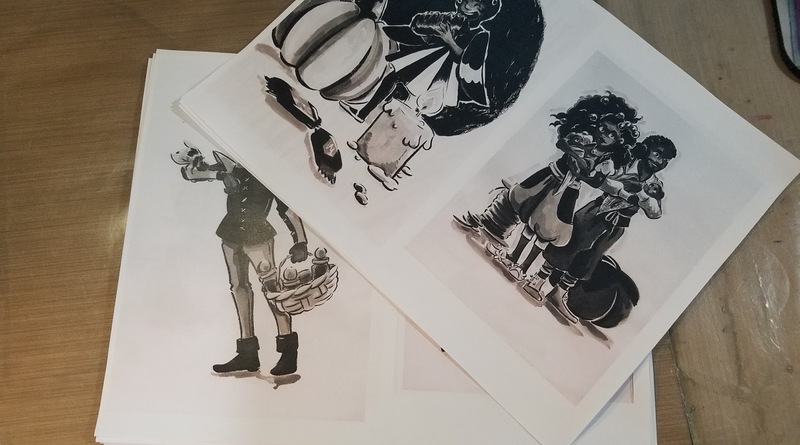 As I'm wrapping up work on Volume 2, and preparing for the looming Volume 2 Kickstarter (sign up here if you'd like to be notified when it launches! ), its a great opportunity to look back and appreciate how far I've come on this creator owned, self published comic. 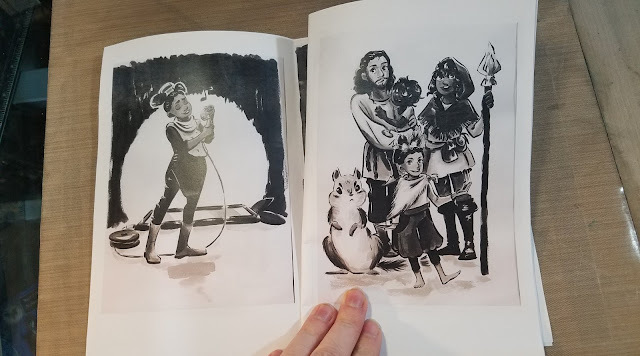 Way back at UNO, I wanted to make comics and kids books and needed the ability to print them out to present at critique. As a student in a Fine Arts program that was vehemently against children's books and comics, I was on my own for most of my production and relied upon trial, error, a lot of printing mistakes, and Photoshop to manually create a booklet. 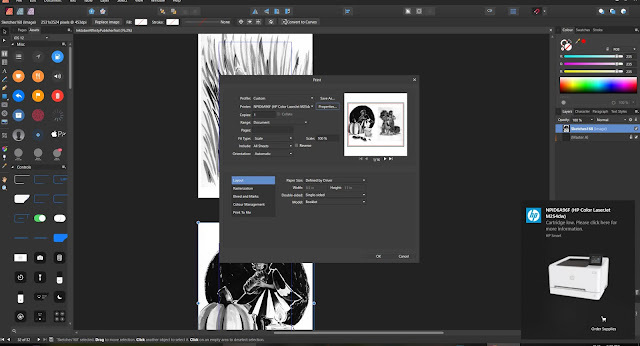 While I was a SCAD kid, I was introduced to InDesign. It seemed like the whole class (save for Heidi, who was already familiar with it) really struggled with it, and although I continued to use it post-graduation, it was only to layout Volume 1, sketchbooks, and zines. Although InDesign is capable of page design, I found myself relying on Photoshop for that, creating individual pages with all the assets, then dropping those files into InDesign. 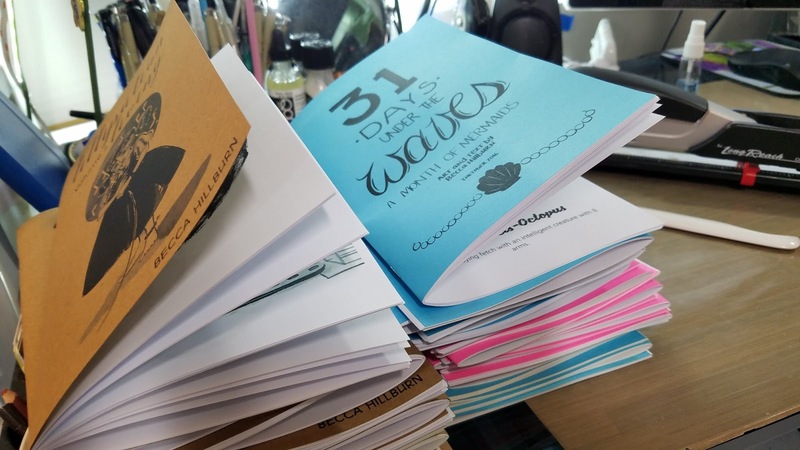 For my Making Comics and Zines class with NCE, I've dabbled with a few free options, which you can read about here, but wasn't entirely satisfied. 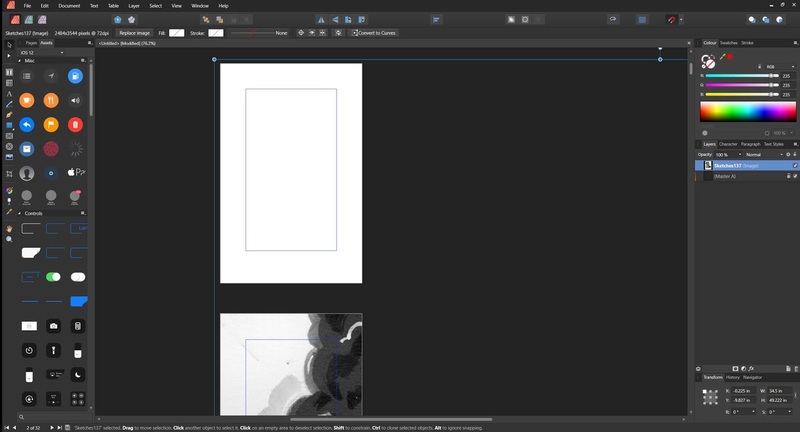 Most were quite bare bones, and while I wasn't expecting something as fully fledged as InDesign, I wanted something that allowed a bit more customization. I ended up asking Kabocha what she used, and while she admitted to also using InDesign, she recommended I check out Affinity Publisher. At first, I balked- I didn't really want to learn another program, but now I'm honestly glad I noodled around with it and gave it a shot. Affinity Publisher is part of a small suite of applications by Affinity-Serif. They currently offer three applications- Affinity Photo, Affinity Designer, and Affinity Publisher. Today we're taking a look at Affinity Publisher, a desktop publishing application that is still in it's beta phase, and free to download. Beta means they're still working on developing it, so it may not be as feature rich as the full version, and it main contain bugs, so your mileage may vary. 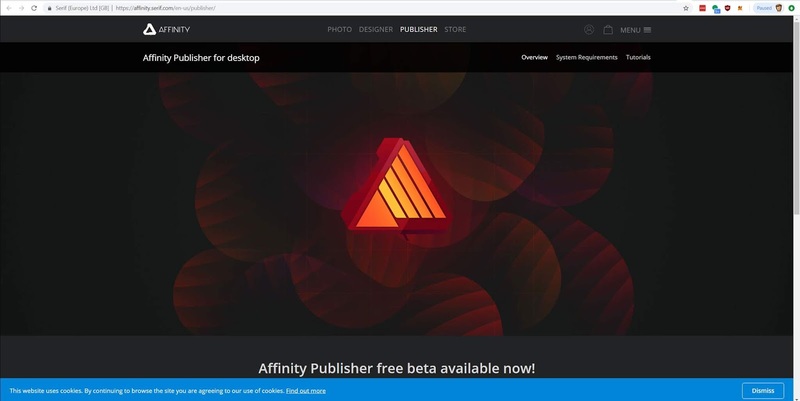 To download Affinity Publisher, you're going to need to create a free Affinity account. Facing pages- this is a view setting- it lays your pages out as double page spreads. 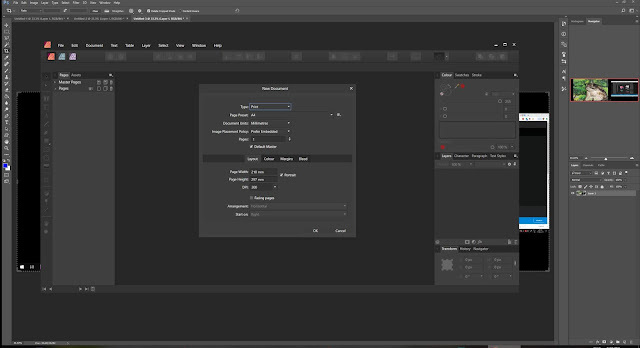 This is particularly useful if you have double page spreads or overlap between the spreads. This is not shown in this overview. You may wish to go through the tabs and adjust Colour, Margins, and Bleed, but these settings will get you started! So this is the basic layout for Affinity Publisher. On the left is the Master- a quick overview of our document. Changes made to the master will effect every page. 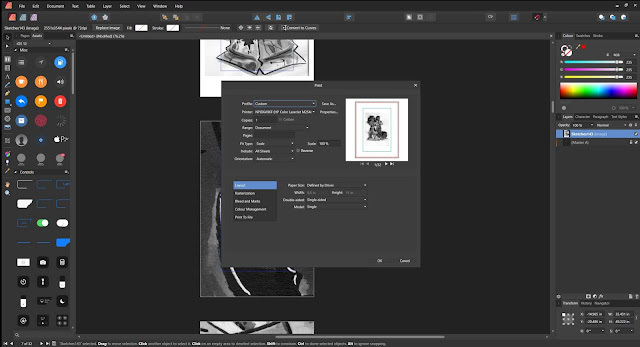 For something simple like a black and white zine with no text, select the framed picture from the toolbar- this will open a window and allow you to select your images. If you hold shift and select all the images you want to place, Affinity Publisher will hold those images in its memory. To place, you simply left click- in this example, we're placing one image per page, so I am clicking, then scrolling to the next page. 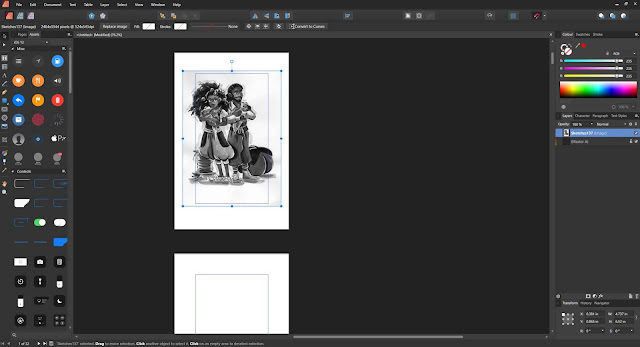 When first placed, images are placed at full size- you're going to need to scale them yourself. When laying out zines and minis, I prefer to place all my images, THEN go back and resize. 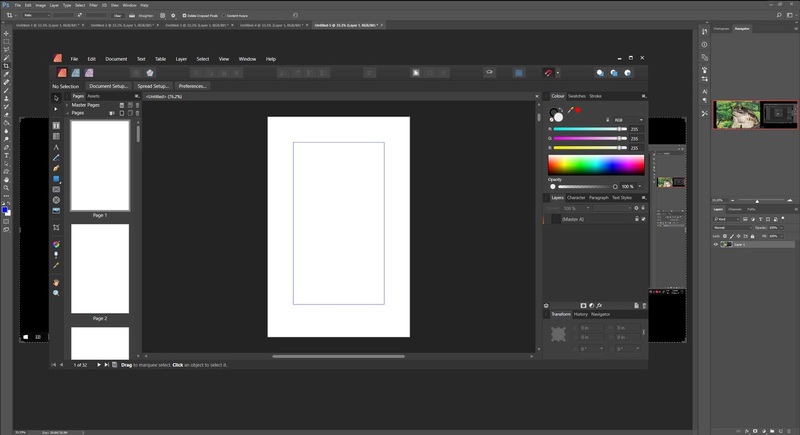 Resizing is simple- for a uniform resize, just go ahead and grab one of the corners and resize it. For a non uniform resize (lets say you want to make it taller), you would hold shift- the opposite of most Adobe programs. 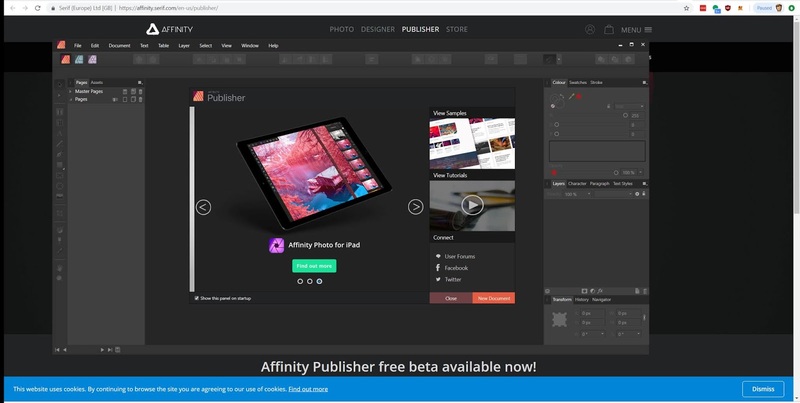 Affinity provides guidelines to help with image placement. I'm still exploring Affinity's print and publishing options- I haven't found a way to to print as a postscript file, and then convert that file into a booklet PDF using Adobe Acrobat, which is my usual course of action when using InDesign. 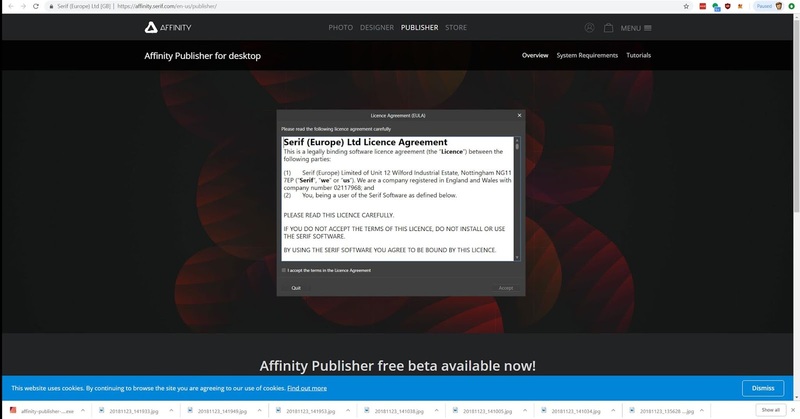 However, Affinity allows you to print booklets natively in the software. You do have an option to print as a PDF, just not as a printable booklet pdf that can be printed by say, Office Max. 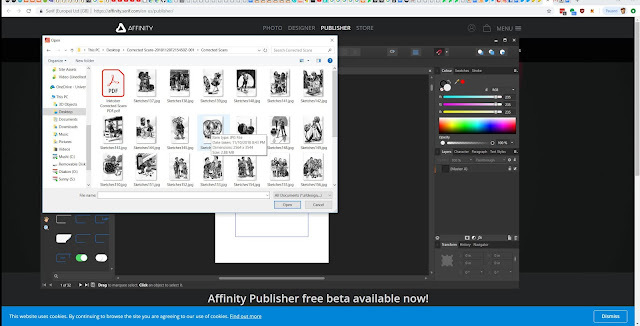 To print as a booklet from Affinity, go to Print, and you should see this dialogue box. 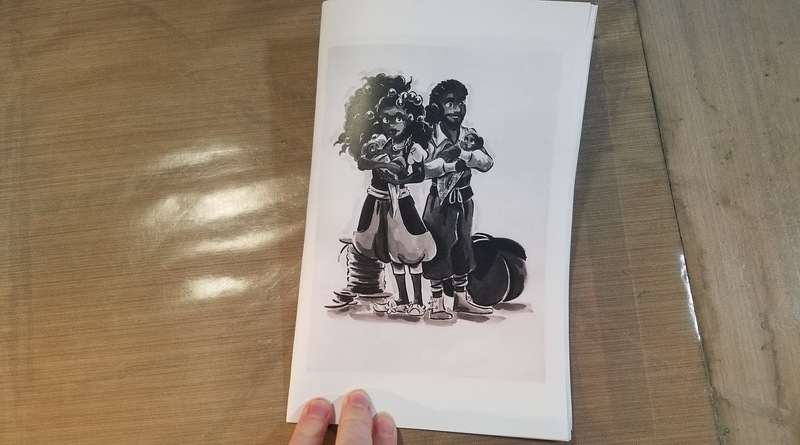 Remember how we talked about how your booklet should ideally be a multiple of 4 or 8 pages? That's because you can print four 'pages' on a single sheet of paper- two on one side, two on the other. 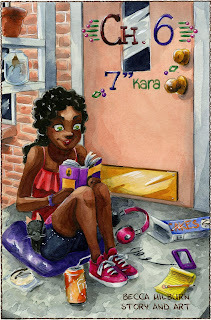 NOTE: If you laid the book out correctly, on the first view, you can see your front cover and your back cover. If you can't see both, you're going to need to adjust your pagecount, and possibly add pages for padding. 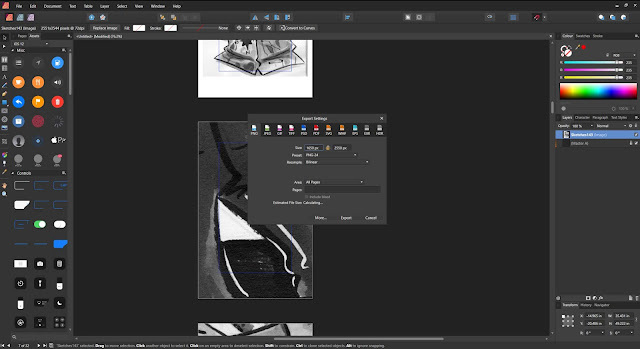 If you're printing more than one copy, and you have a duplexing printer, select Collate to save yourself some sanity. 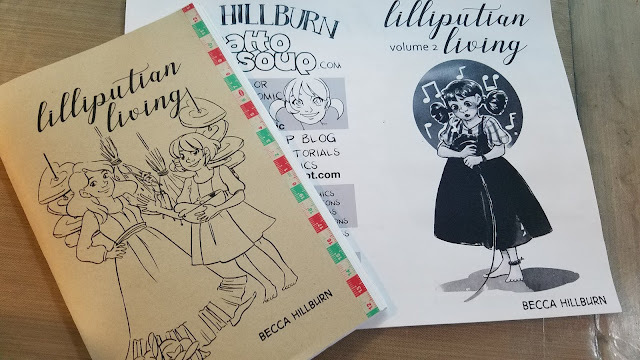 This was a quick and dirty mockup of Lilliputian Living Volume 2, mocked up to test the suitability of Affinity Publisher for my layout needs. I've gone on to use it for ALL my layout needs. My 2017 and 2018 Volumes of Lilliputian Living. Volume 1 was laid out in InDesign, and printed through Adobe Acrobate. 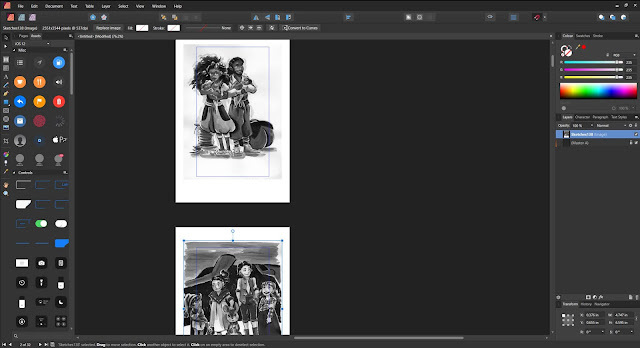 Volume 2 was laid out in Affinity Publisher, and printed through Affinity Publisher, although page designs and text were created in Photoshop. I use Affinity Publisher to layout and publish my Making Comics and Zines (2018) and Making Comics (2019) students'; mini comics and zines. 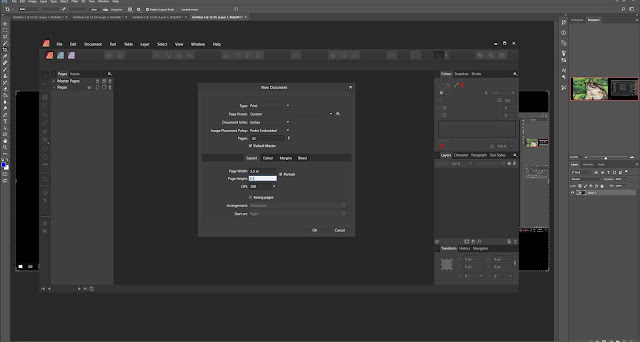 I really like this program- it's easy to use, lightweight, and while it does crash sometimes, it works quite well for a beta program. 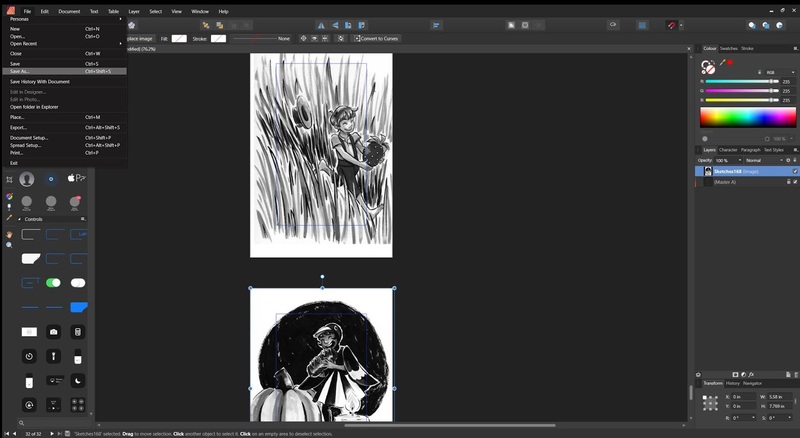 This is the program I recommend to my Making Comics students.